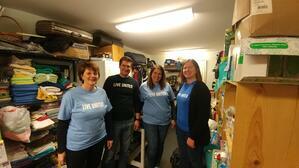 UWECI staff integrated volunteerism into a Day of Service in honor of Dr. Martin Luther King, Jr. 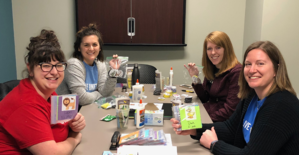 This year, in honor of Martin Luther King, Jr. Day, the United Way of East Central Iowa (UWECI) staff dedicated time to give back to the community. We had the opportunity to volunteer during morning and afternoon shifts at local nonprofit agencies. “I enjoy keeping the spirit of service alive on Martin Luther King, Jr. Day. 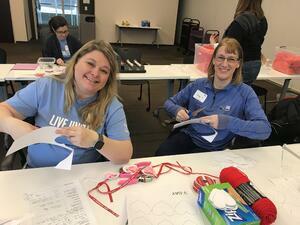 It feels good knowing that our time helps organizations be more efficient, so they can focus on better serving their clients,” said UWECI Senior Manager of Volunteer Engagement, Sue Driscoll. Valentine’s Day Prep & Cleaning at the Cedar Rapids Public Library: Half of the group prepared crafts for the library’s upcoming Valentine’s Day program, while the other half cleaned the children’s section, making sure the toys, electronics, and shelves were sparkling for all the little visitors. Organizing at Willis Dady: A group of UWECI staff spent a couple hours sorting and organizing donated items at Willis Dady, including gathering blankets and supplies that could be used immediately by clients. “It was great to see results in a short time, and to hear how our service made a difference for their organization,” said UWECI Training & Organizational Development Coordinator, Brenda Mohr. Crafting at YPN: The group spent their time cutting, gluing, and putting together learning activities for children for YPN staff to take on in-home visits. The final products included a memory game and a reading activity. “I enjoy working on projects like these and it is a bonus to do it alongside my coworkers. I know it helps the agency and makes me feel like I’m contributing in a small way,” said UWECI Senior Coordinator of Leadership & Annual Giving, Carole Dzingle. “I appreciate working for an organization that takes time to celebrate Martin Luther King, Jr.’s commitment to servant leadership through volunteer projects,” said UWECI Senior Manager of Operations, Abbie Covenah. Thank you again to the nonprofits and staff who served our community through one of these opportunities to commemorate Dr. Martin Luther King, Jr.’s life.